Falling to my knees, I found myself at an unexpected altar. I may have pushed a little too hard to arrive in Santiago before the crowds became unbearable; and then eaten some questionable local seafood for lunch. All of which induced a temporary but debilitating stomach upset. I could hardly stand let alone walk around the city. My arrival in Santiago was supposed to be a joyous and cathartic release after so many miles of prayerful walking. Instead, I was vomiting in a shared bathroom at an overpriced nightly pension just behind the Plaza de Obradoira. I could overhear the jubilant cheers of groups arriving at the cathedral from my bed. Earlier that morning, when I had arrived in the Plaza, I had taken a wrong turn in the city’s labyrinthine city corridors and walked into the open rectangular plaza from the south, rather than through the small portal on the north side where a bagpipe busker plays swelling Celto-Galician melodies for the arriving pilgrims. When I stepped into the plaza, rather than feeling elation, I felt slightly confused. In the photographs it was weathered, and lichen covered and had the character of an ancient baroque cathedral, now it was immaculately clean, like the stone had just been laid. For a second I wondered if I was in the right place. Then, seeing some other pilgrims arrive and begin to celebrate I knew that of course I was in the right place. It turns out the façade had just been restored, and the scaffolding had only come down the day before. It was beautiful, lacking the characteristic grit and age I expected, the years of chips, pocks and stain had been lifted to reveal its true and youthful self. A beautiful metaphor for the spiritual life. Entering the cathedral, a pilgrim’s Mass was wrapping up, and I waited at the back until the crowds began to reverently disperse. Wandering the nave, it felt smaller and less assuming than one might expect. It certainly felt much different than the classically gothic cathedrals of León and Burgos. Its baroque motif and adornments were a bit dusty and worn down, there was scaffolding above the altar, a few pigeons flew about the rafters, and its arches and ceiling were in desperate need of repair and restoration. And yet, despite its unassuming and worn appearance, the space exuded a kind of sacred expectation. A cue of people lined up to hug a golden statue of Santiago, Saint James behind the altar, and another waited to pray at the reliquary holding his reputed remains. I did both rituals with a smile. I had finally arrived at the cathedral and, despite a wobbly landing, I began to fill with the satisfaction and joy of a pilgrimage completed. I then sat in the pews waiting for the next Pilgrim’s Mass and tried to be as open as possible to the reality of what was before me: the goal accomplished, the eccentric beauty, the diversity of my fellow pilgrims. The cathedral Mass was well orchestrated, the Bishop spoke a slow and discernable Spanish, and the music added to the reverent atmosphere. I lingered in the cathedral after the Mass snapping pictures, craning my neck at the Romanesque arches. As I say, that night I fell ill, but by the morning I was OK enough to go back to the cathedral and walk around the city, visiting its many other treasures, churches and plazas over four days. As I rested from thirty days of intensely regimented walking, my heart filled with the romance and beauty of the place. I also began to reflect more deeply on the meaning and impact of pilgrimage in general, and my first walk on the Camino de Santiago. When I was ten or eleven, I jumped into a big van with a dozen or so of my fellow Mormon youth and headed to San Diego for an overnight trip. We were going to walk a section of the Mormon Battalion Trail, the historic route which the US Army-appointed Mormon Battalion marched before the end of the Mexican-America War. This march never saw combat, but it helped open a southern route to California as the US annexed much of the Southwest from Mexico. We wanted to experience firsthand what it was like to walk the same trail our ancestors had walked. We were told of the hardships and inconveniences they had to endure. We walked to show gratitude to their sacrifice and build character. This pioneer pilgrimage is not uncommon in Mormon culture, and pioneer treks, reenactments and historic sites are a big part of forming Mormons in their own heritage and identity as America pioneers with a unique claim to the nation and its promises. In 2008, Mormons from across the US participated in a reenactment of the entire Mormon Battalion trek, a journey of over 2,000 miles. As an erasable teen, I just remember feeling annoyed, and wanting more snacks. But even then, my self-centered brain managed to muster some measure of reflexivity on just how difficult life must have been for those who came before me. At the beginning of my pilgrimage to Santiago, one thing that surprised me was just how secular and recreational everyone’s motives seemed to be. As a religious person, I was frustrated by this. I even heard a Catholic priest say he was walking the Camino to get away from his hectic and busy life as an urban parish priest! I am not opposed to recreation or cool experiences, but to me, for a pilgrimage to be a pilgrimage, it must in some way connect the self with the sacred. Wandering through the Pilgrim Museum in Santiago, a central display defined pilgrimage as a universal human phenomenon, existing in many religions and cultures. A pilgrimage is an allegory for the human experience, it is a holy path to a holy place; “a journey in search of spiritual meaning.” It is both destination and journey. In Spanish, ‘Camino’ simply means ‘way’ or ‘path’, and Christianity was initially described as The Way. Tao, the central concept of the constellation of folk religions and philosophies often referred as Taoism, also simply means the ‘Way’. Both Mahayana and Theravada Buddhisms embrace an eight-fold path to Nirvana, or enlightenment. The Psalms frequently refer to God’s law as a ‘path’, the path which the righteous follow. “Show me your ways, Lord, teach me your paths” (Psalms 24:5). For the Medieval Christians, braving the dangers and toils of the path, was not about having an experience or about leisure. It was about seeking forgiveness for wrongs, self-denial in the service of spiritual growth, healing from a debilitating illness, for petitions for family and friends that could not make the journey. It often involved great expense and great risk. The path was an objectively sacred path, to an objectively sacred place. Saint James was a spiritual force whose intercession was hoped to effect actual things in the world. He was no archetype or whimsical character from Christian myth. Pilgrimage was a spiritual technology in a world where life was short, difficult and dangerous. With the Enlightenment’s emphasis on reason, and the Reformation’s emphasis on grace over works, pilgrimage began to lose its force and meaning. Catholic superstition and idolatry was looked down upon, and for many Protestants, there was no path to walk since we are only saved through God’s grace, not through the Sacraments, or through our efforts. Today, I would say a majority of those who walk the Camino are not affiliated with any particular religion, or have left the religion of their upbringing. At first I felt lonely in my religious and spiritual motivations. I became a little more judgmental and self-righteous than usual. 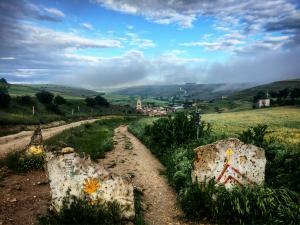 For many the Camino was undeniably a social experience, or an athletic challenge. But despite my cynicism, it was an overwhelmingly positive and healing experience for many as well. 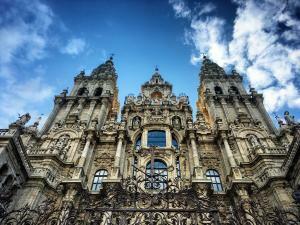 The Camino can be life changing, life restoring, and so much more than just an interesting get away. The Camino has the ability to heal a part of people that isn’t readily available in daily life; that was nourished by the movement, the friendship and the sunshine. I would not say that my experience was particularly life changing or healing. My pilgrimage to Santiago de Compostela was definitely not what I expected. What going in promised to be a conventionally spiritual experience that traversed some beautiful country, turned out to be a very raw encounter with my most persistent demons. However, even though at several moments I thought of quitting, or at least wanted the experience to be over, I am so grateful that I did it. I am so grateful for the privilege of being able to take this time to just walk. The lessons I gleaned are still bubbling up. 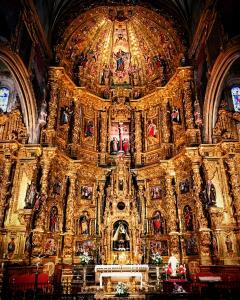 But I learned so much about the heritage of Christianity, about Spain, art and architecture; and yes, about myself. Here are a few of the major themes that emerged as I reflected on my walking pilgrimage between Pamplona and Santiago de Compostela during the month of June, 2018. I am grateful for the revival of pilgrimage as a spiritual practice, and despite my cynicism toward its popularity, I really do believe that it is ultimately a good thing. I do however worry that we (inclusive we) focus too much on the external aspects of pilgrimage, with the temptation to broadcast our experiences to the world via social media in order to garner admiration and praise. I certainly wrestled with metering my own use of social media during the trip. Use of social media aside, I feel that in order for one to really be a pilgrim (peregrino) rather than a tourist (turi-grino), awareness, attention and interest in the spiritual dimension of the journey should be primary. Pilgrimage is not just experience, hiking or athleticism. Pilgrimage is an important and rare embodied spiritual practice indigenous to Christianity. Christianity (Catholic and Protestant) has long neglected the body in our worship and spiritual practice (we don’t have our own version of Yoga). Thus, pilgrimage is an important way of re-incarnating Christianity, bringing us back to the body. Pilgrimage is powerful because it is fully embodied, but at the same time perfectly mirrors the spiritual dimensions of life itself as a spiritual journey. The phenomenology of pilgrimage as spiritual practice is captured by the slow step-by-step-by-step walking of which it is made. It should not be rushed. Patience is a virtue. It is an ongoing encounter with the world as we slowly move through it. It is boredom and exhaustion and sickness and discomfort and social awkwardness and silence and monotony. It is ugly and beautiful places. It is moving at a primordially human pace. It is stopping to sit, stare, listen, cry, feel, pray, poke something strange, smell flowers, kick stones, wave at cows, laugh, remember, lament, worry, jot down an idea, think about the future, find a place to pee, and say ‘Buen Camino!’ for the 50th time. It is the sound of wind through cottonwoods, rain drops on the small leaves of a hedgerow, our own heart beating, speeding semi-trucks, distant wind mills, planes over head, pilgrims discussing in a language not our own. Pilgrimage is walking through a land of deeply embedded cultural memories, none of which were my own. 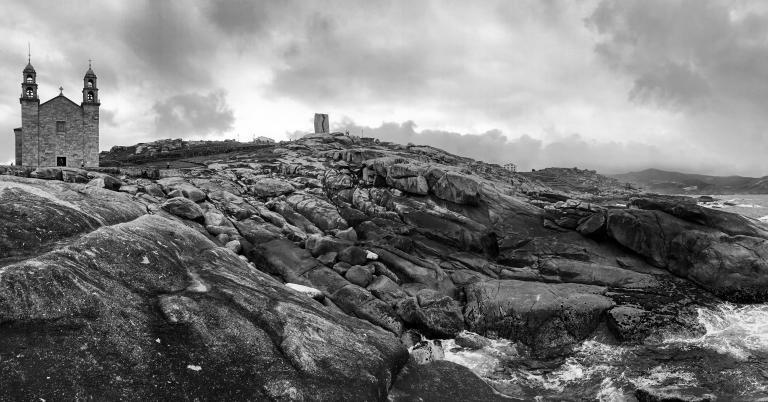 The hilltops wink at their former pagan worshippers; the brittle ruins of the Roman Empire poke out like dry bones; there are whispers of the long ago Muslim conquest. The farmland exudes the long slow dwelling of a thousand generation of farmers, peasants and artisans. 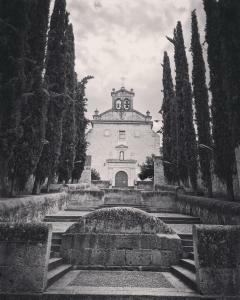 And yet, there were several moments on the Camino that transported me back to places I have lived in my life. Walking toward León from a high hilltop, the view of the cathedral spires and the open arid valley behind it looked uncannily like Salt Lake City, Utah with the spires of the Mormon Temple and the Great Salt Lake Basin in the background. The semi-arid landscapes of the Meseta, and the smell of eucalyptus plantations in Galicia reminded me of my first home-place, California. There was a sort of present-invoking-the-past quality to these places. Unfamiliar landscapes they might have been, they still triggered many of my own past selves and experiences. These memories and thoughts then become part of the fabric of embodied reflection, lesson and landscape. This phenomenology of walking is an important aspect of any spiritual practice that engages not just our minds but our whole person and pushes and challenges us in new ways. Like the Mass, which follows more or less the same pattern every time, ritual repetition is a way of returning to and reinforcing essential spiritual truths. This repetition with change, doing the same thing every day in slightly different places under slightly different circumstances is part of the holiness of pilgrimage. The slow change of the day mirrors the slow ripening of our own souls. The mistakes and sin which we continually find ourselves making are opportunities to return to God yet again, to do it again. 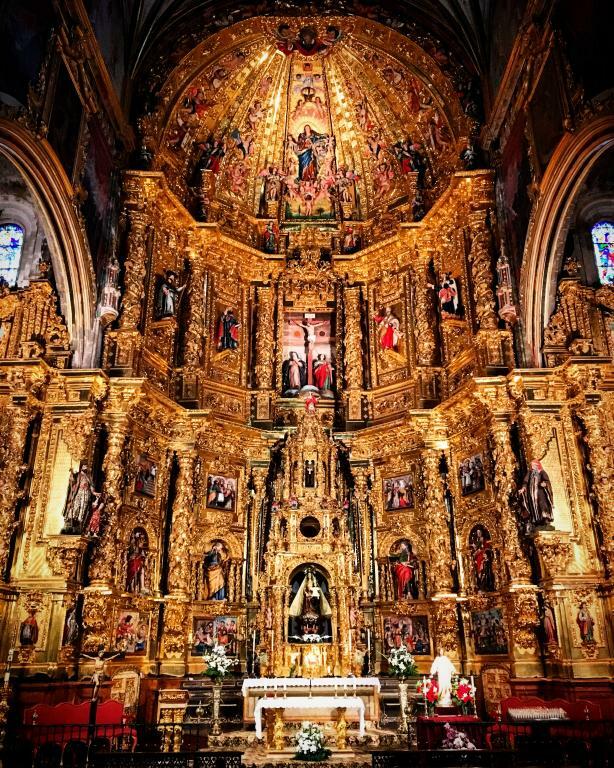 Magnificent ornate Retablo at Ascension church in Navarrete. Early on in my walk, it was clear that there was a spectrum of feelings about the ubiquity of Catholic sacred spaces on the Camino. Most of the churches, if they were open, offered stamps for our pilgrim passports; and most of the must-see destination along the Camino were historic monasteries, hermitages, chapels and cathedrals. It was sad to see so many pilgrims simply hurry past an open church door, or shrug at a suggested donation sign. Those who made it inside often strolled through the aisles and side chapels as if in a museum, or simply stamped their passports and left. To a certain extent I get it, there is a need to conserve one’s energy with so many churches along the way. I too found myself in a sort check off mode in all too many minor churches or hermitages, but sacred space is an important dimension to walking a pilgrimage. The animosity toward churches and cathedrals went deeper for some folks I met. I would sometimes overhear pilgrims say that the sacred spaces were a waste of money—monuments to corruption and feudal extraction of wealth, first from the Spanish peasantry and then the ‘New’ World. One day, early in my Camino, I walked for a kilometer or so with two men from Mallorca and for them churches were a sign of the church’s earthly power, nothing more. Another man admitted that the churches were great and all, very beautiful, but that he had long since stopped going to Mass. He balked at the notion that he needed a priest to forgive his sins, or that somehow the sacred began once he stepped one foot inside the church. He didn’t need a church to pray to God; wherever he knelt was his church. I am sympathetic to these stances; the church has at many times been too focused on power, wealth and prestige. And, as someone who experiences God’s presence in the natural world, I am not opposed to viewing the world as sacred. However, what I would say to these arguments (and what I said to these pilgrims as we walked) is that sacred spaces are monuments to beauty, and an important centering complement to the diffusing nature of walking. To the second criticism, I tend to agree in principle that the world itself is sacred because it was made by God. However, our awareness of God’s presence is not spread equally throughout our lives. It is like saying that fitness can happen any place, not just the gym; sure it can, but they sure help! What is powerful about sacred spaces is that they are set aside (the root of sacred means set aside) to amplify the sacred dimensions of life, and push us to the boundaries the sensible world. They are places where we practice the presence of God; where we train ourselves to discern the sacred in the world, each other and ourselves. Dedicated sacred spaces, spaces that take beauty seriously, are in my estimation the best places to bring together the paradoxical aspects of spirituality: material and spiritual, tangible and intangible, temporal and eternal, universal and particular. Their arches, height, columns, symmetry, depth and focal points participate in an objective beauty that is universally appealing. Yet, with their insistence on corporality through painting, statuary and iconography they stubbornly insist that the viewer not get lost in the transcendent, but take into account the bodies and lives and stories of the saints and the central figures of Christianity. Cathedrals and churches are filled with statues of triumphant and ecstatic saints yes, but also broken, beaten, bleeding, breast feeding, crucified, tortured and burnt alive saints. Catholic sacred space points to resurrection and eternity, but they do so through the brutalized body of a Jewish peasant. Sacred spaces point to the transcendent with a finger made of flesh and bone. In one particularly striking example, on a tour of a 16th century Franciscan convent, there was a life sized statue of the bleeding body of Jesus laid to rest in the tomb. In the wound in his side was a monstrance and tabernacle. A monstrance is a small clear case for a consecrated piece of Eucharist bread, and the tabernacle is where the left over consecrated bread is stored after Mass. The monstrance is used in Eucharistic Adoration, and in processions. For Catholics, once consecrated, these hosts are the actual body of Christ under the appearance of bread. In the gruesome statue at the convent, rather than decorated in abstract design and flourish, as is typical, it was in the side of Christ. While I often find baroque statuary to be distasteful and hokey, even grotesque, this statue perfectly exemplified Catholicism’s insistence on both the transcendent and immanent aspects of God. God is utterly beyond our comprehension, and utterly within our grasp. God does not cause our suffering, he endures it with us. Another way sacred spaces bring together the paradoxical aspects of religious life by blending objective and subjective dimensions of beauty. I think that one of the reasons so many people are drawn to massive gothic cathedrals is that their presence, size and forms participate in objective beauty, beauty whose affect comes from outside human construction. The perspectives, arches, domes etc. are affecting, they act on the human consciousness and draw one toward the transcendent. On the other hand, the motifs and décor, the styles of the adornment and statuary are often framed within a particular period or style whether Romanesque, Gothic or Baroque which appeals to a more subjective sense of beauty through historic and cultural cues. There is also a spiritual ecology to Catholic sacred spaces, especially cathedrals. Living in the age of national parks, protected areas and wilderness, it is easy to overlook that Catholic sacred spaces are also stylized homages to the sacramental quality of the world itself. They are monuments to the transcendent, to the eternal, but undeniably celebrate the particular beauty and sacredness of this world. Cathedrals were built as microcosms of the medieval macrocosm, as cosmic-spiritual observatories of sorts. They are oriented along an east west axis, with the altar facing east, the direction of the rising sun, a symbol of Christ. They are often cruciform in shape, which is symbolic of the cross, but also of the human person, or even the personhood of the world. The church is the mystical body of Christ of which we are member, and with the resurrection, that body extends into the entire universe. The priest, in his vestments, recapitulates all of creation and brings the bounty of creation and work of human hands (our offerings, and bread and wine) to the altar. The Sanctus prayer is a way for human beings, led and symbolized by the priest to join the prayer of the universe and creation, not to speak over it. The priest’s vestments change color with the seasons, and the liturgy is meant not only to reflect the praise of God that is happening all the time in heaven, but to participate in the archetypal cycle of the earthly seasons of birth, life, death and resurrection. The cathedral itself is designed as an early paradise, a Garden of Eden. The columns are trees whose tops are often adorned with stylized leaves. The ceilings are sometimes adorned with stars, or at least lead the eye to heaven. The moldings are bursting with flowers, vines and leaves. The stained glass, statuary, retablos and paintings are filled with birds, trees, mammals, grottos, light and seasons. It is also very common for the altar retablos column’s to feature sheaves of wheat and spiraling grape vines. On the outside, many Spanish churches were often literal bird sanctuaries. Walking into a new town, sometimes the easiest way to find the church was to watch where the swallows were flying. Often placed on small rises or hilltops, church bell towers were almost always bustling with bird life. Purple martins and barn swallows were the most abundant, but there were also pigeons, sparrows and sometimes colonies of storks. I also found that elements of my walks were reinforced within the décor of the cathedrals. For example, the rose windows of the Leon cathedral felt so much more powerful because all along the Camino, the wild roses were in full bloom. And, one cannot help but notice the thousands of acres of vineyards and grain along the Camino, elements which are daily lifted on the altar during the Eucharist. Walking through oceans of grain, and row after row of vineyard took on a special significance when I knew that in the evening I would attend Mass. In sum, sacred spaces at their best are meeting places for inner and outer landscapes, between transcendent and immanent, between mortality and eternity. For this reason, they are such an important complement of our walks. Sacred space is a focal point and a place to practice of the presence of God. It is a ritual of repeatedly coming to God as we are, and then trying to take a little more of God with us into the world when we leave. Carmelite Monastery where John of the Cross is Buried. Before I flew back to the states, I took a train to Segovia, just northwest of Madrid to visit the final resting place of Saint John of the Cross (1542-1591), a Carmelite mystic who I had read before the Camino, but who became increasingly important to me as I realized just how much my own experience of the Camino was reflected in his phases of spiritual development. My first official pilgrimage felt very much like what John of the Cross would call a Dark Night of the Soul, a period of purification (purgation) where despite being immersed in spiritual practice, we feel a strong sense of God’s absence and spiritual desolation rather than consolation. The world famous and now canonized Saint Mother Teresa experienced nearly 50 years of this darkness, after a very vivid experience of hearing the voice of Jesus call her to start her work in the slums of Calcutta. I am not glorifying this sort of experience, or wearing it as a badge. I am not saying that I suffered anything all that dramatic; but, my experience on the Camino de Santiago was surprisingly difficult. I did not connect as easily or readily with my fellow pilgrims as I expected; I felt more pain and discomfort than I thought I would. It was also an expectedly direct encounter with many longstanding insecurities, fear, depression, temptation, feelings of deep unworthiness and religious doubt. I did not often feel an obvious sense of God’s presence, of my own goodness, of the going-to-be-alright-ness of the world, or even of the truthfulness of Christianity. When the mystics talk about spiritual darkness, or I say that I encountered it on the Camino, we are not talking about a force in opposition to goodness. Darkness is a shade of spiritual experience so to speak; it tries to capture the fact that the spiritual life is not always marked by reward, positive emotions or blessing. The spiritual life is not a vending machine. For some reason when it comes to religion this lesson seems to be out of vogue. We don’t always feel a direct correlation between spiritual growth and current mood. I feel confident that if we insist on correlating Gods presence with good feelings, we are in danger of turning spirituality into a sappy TV commercial. Everyone knows that if you want to be a better runner, athlete, artist, writer, politician, or just about anything, that you often have to give up certain pleasures in order to grow; that one must push and stretch oneself to make progress. Pilgrimage as a spiritual practice is not just about the positive experiences and the sweetness of feeling God’s presence in places, people and nature (though it certainly is that too), but also learning to work through the absence of these consolations as well. Faith is being able to keep going even if we don’t feel a reason to. In The Divine Comedy, Dante wanted to immediately climb the Holy Mountain to get to God, but before he could, he had to pass through hell and purgatory. His path showed him the spectrum of human suffering and sinfulness and the ways that we turn away from God. Catholic spirituality intuits, sometimes gruesomely, the idea that suffering is redemptive. 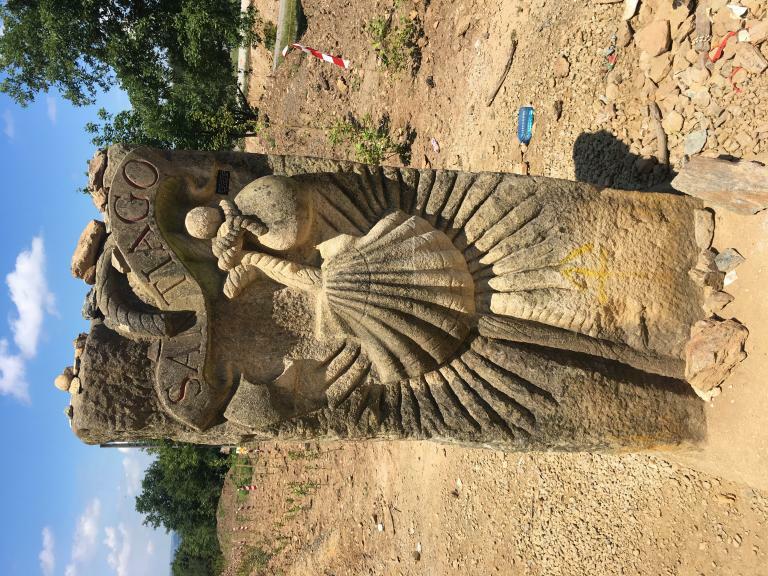 The Camino was filled with statuary depicting the suffering the martyrs, with statuary of the Sorrowful Blessed Mother with knives stabbing into her heart, and the brutalized body of Jesus. As I have said, while I find these statues mostly disturbing and sometimes hokey, they made a certain kind of sense as a pilgrim. Archetypal suffering didn’t seem as foreign to me when I limped into a church soaked in sweat. An important part of pilgrimage as a spiritual practice then is being willing to subject oneself to difficulty and discomfort so that God can effect growth in the soul, even if we are not aware of it. On a pilgrimage we do not accomplishing anything other than opening ourselves to what God is seeking to accomplish through us. I was mostly annoyed by the obnoxious tagging and graffiti along the Camino, but one day as I walked, for some strange reason I stopped and read one of the hand-written scrawling’s on one of the many Camino signs. It read: “We only accept the love we think we deserve.” The words struck me very powerfully. I have always struggled with self-acceptance. I have lived much of my life believing that I would be loved only for being smart, or nice, or morally worthy. My religious life has been in large measure a hoped for equation between pious works for God-given blessings. Part of my ongoing process of healing these deep wounds will simply be learning to trust long enough to unclench my defenses and feel just how much love has always been and is already around me. Not resolving to work harder, to be better in these bullet pointed areas, accomplishing these goals by this date in order to validate my existence. My family already and always will love me. The people who call me friend, already love me. God already loves me. It is amazing just how difficult it is for me to accept this reality! 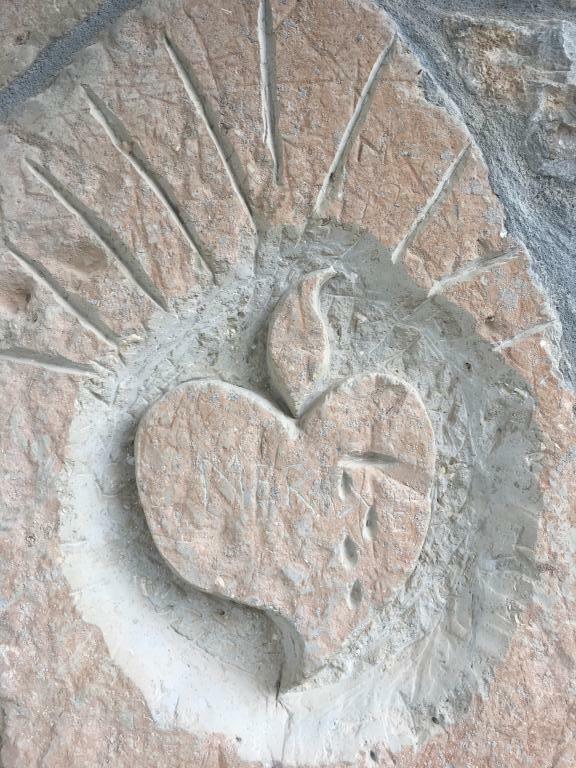 To use a symbol from the Camino, my heart is so often like a closed shell, I use most of my energy and strength keeping the shell tightly shut, my walls up, and myself safe from hurt, disappointment and rejection. The spiritual life is not about earning God’s love through works, pilgrimage is not about showing God how dedicated we are, it is about putting ourselves in a position of vulnerability so that love freely flows from outside to inside, from inside to outside. At so many times as I walked along the Camino, the calcified shell around my heart cracked open ever so slightly—walking before a magnificent sunrise or sunset, experiencing the peace of solitude, listening to the birds sing, watching butterflies waft in the breeze, getting a kind smile or kind work from a fellow pilgrim, during the Mass, listening to a Podcast, reading a Psalm that spoke perfectly to my state of mind, standing before a piece of art, or ancient retablo—only to promptly shut again when difficulty arose, someone was unkind, or I felt vulnerable. The church at its best is a sanctuary for the slow and messy work of becoming holy. The spiritual life at its best, is the ongoing acceptance that this work is already underway. There is a delightful legend about a local saint who lived not far from where this church was located. Saint John of Ortega (1080-1163), after surviving a shipwreck, devoted the rest of his life to improving the Camino de Santiago through the notoriously dangerous Oca Mountains. Saint John established a monastery and a hospital for pilgrims, and was nicknamed ‘Ortega’ which means nettles, because he lived as a hermit in the mountain forests. Some years after his death and burial, his tomb was opened and to the amazement of the crowds, a pleasant aroma wafted out along with a swarm of white bees. This was taken as a sign of his blessedness, and he became a patron saint of children, hospice care and fertility. In William Faulkner’s story about a man hunting an elusive and legendary bear it is not until the hunter puts down his gun that the bear reveals herself to him in the woods. We often think that we are seeking God, but really it is God who is seeking us. Much of my spiritual practice, I realize, has been about trying to control God, on my terms, when I am ready, when I feel spiritual, when I want something. 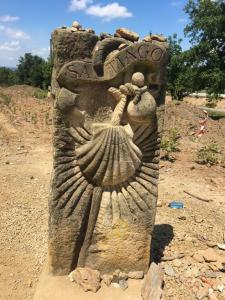 The Camino has taught me that this is an idol. God cannot be caged, Holiness is messy. All of our liturgy, ritual and practice is but an exercise in learning to be open to God, not a spiritual technology for manipulating or binding God into our timelines or will. If I only accept the love I think I deserve I muzzle the effusive grace of a wild God. Of course, I certainly did leave the Camino with a to-do list, with priorities, with ideas, with things I want to accomplish, with resolutions; but I also left with the reassurance that the essence of the spiritual life is to live in love, and love can only be felt and given in the measure that it is first accepted. There is a common phrase on the Camino de Santiago: The end is the beginning. Ringing of paradox, this cliché has come to resonate with me as I reflect on my experience. In Christianity, the end of life is the beginning of eternity. The moral of the story is the story itself. The destination and journey are part of the same sacred whole. The Cathedral of Santiago is sacred, but so are the many paths that lead there. Now more than ever, reflecting back on my original motivations to be a pilgrim, I realize that I am only at the beginning of the spiritual life. Pilgrimage was far more difficult than I expected, I went hoping to find something new, but what I discovered is that pilgrimage is not about getting something, but opening ourselves to the wealth that is already within us at each blessed moment whether filled with joy, sadness, pain or anxiety.